Mimì: the first real Spinning Top interacting with your iPad. A group of archeologists has mysteriously disappeared during an expedition to the risen island of R'lyeh. You are a member of a rescue team sent to aid them. You'll need intuition, nerves of steel, and clever acting if you're going to survive and win the game. Who will believe you? Who is who and who is what? Exactly, "Stay Away!" because you can't trust anyone and no one will trust you! 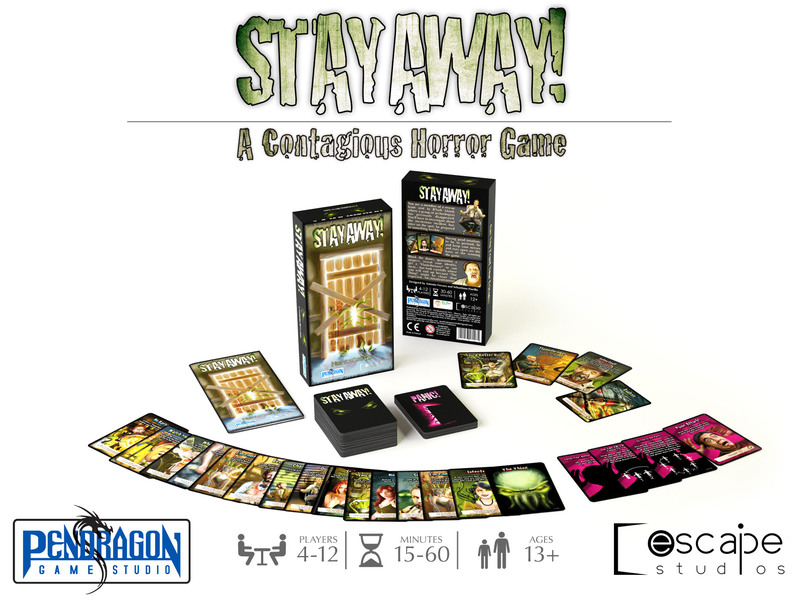 “Stay Away!” is a game for 4-12 players. The underlying philosophy is to get chills of fear while having fun together. The concept is simple, but effective: this is basically to track down "The Thing", a creature awakened from a nauseating eternal slumber on the emerged R'lyeh island, that has the capability of possessing the human body, cloning it and there taking its place. So, as you play you won't know who “The Thing” is or when someone will become “The Thing” or who is infected or not. Having good intuition, to be to pretend, lie and keep your nerves and eyes open are the basis of winning the game, but you never know how it will end: you may be following in the footsteps of "The Thing" but then become" Infected" and have to negotiate in the name of “The Thing”. Anything can happen and this is what creates chaos, fun and tension in the group of players. At the beginning of the game, all players are Humans except the player who receives "The Thing" card in the first round. From that moment on, that player assumes the Role of The Thing and he cannot discard or exchange this card. The archaeologists are looking for The Thing. Their goal is to work together to to identify which player is The Thing and roast it with a "Flamethrower" card. One Human will become The Thing on the first turn. 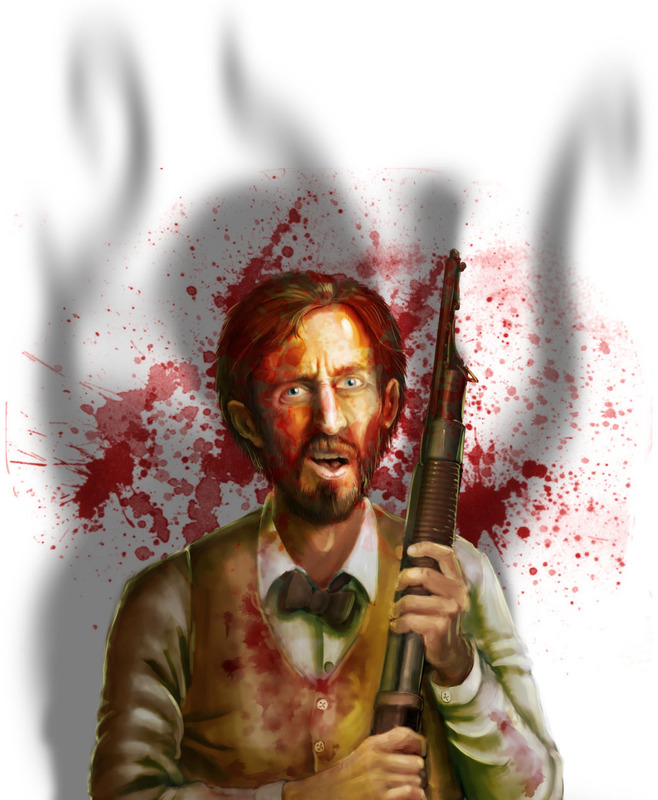 Its goal is to annihilate the Humans or turn them into Infected by passing them an "Infected!" card. You remain Human until The Thing passes an "Infected!" card to you during a card exchange, becoming an Infected and taking on that new Role: you are now an ally of The Thing and must take care that its identity is not revealed. To survive, The Thing must try to hide its identity and cast suspicion on the others, so the Humans can’t locate it (and roast it). The Thing is the only player who will know the Roles of every player in the game, and will be the only one who can declare at the end of the game that there are no more Humans in play. During the game, it is perfectly legal to talk to the other players. You can announce your identity or bluff by making false declarations to cast suspicion on the others, but you must never show your cards to anyone (unless you are required to by a card). It’s up to the other players to decide if they trust you or not, judging your behavior and choosing whether to join you, eliminate you, or run away! You cannot hold more of three "Infected!" cards in your hand. At the beginning and at the end of your turn, you will always have exactly four cards in your hand. 1) Draw one card from the deck and add it to your hand. 2) If you draw a PANIC! card, you must play it immediately and discard it (face down) after you use it. B) Play one STAY AWAY! card from your hand, follow its instructions, and discard it to the discard pile (face down). 3) Choose one STAY AWAY! card from your hand and offer it to the next player in the order of play. That player must choose a STAY AWAY! card from his hand and exchange it for yours (without revealing either card). If there is an "obstacle" between you and the next player (such as a "Barred Door" or "Quarantine"), you do not exchange cards. After you complete all three steps, your turn is over and the next player begins his turn. There are two types of cards, recognizable by different backs (STAY AWAY!, and PANIC! ), that are combined to form a single deck. 1) "The Thing" card is unique and has no number. It must always be included in the deck. 2) The other cards you must use depends on the number of players: all cards with a number in the bottom right corner greater than the number of players are returned to the box and are not used in the game (e.g., in a 6-player game, you must discard all the cards with numbers from 7 to 12. You only use the cards numbered from 4 to 6 for the game). 3) From the remaining cards, temporarily set aside the "Infected!" cards, the PANIC! cards, and "The Thing" card. 4) Take at random a number of cards (from those left in the deck) equal to four times the number of players minus one (e.g., in a 6-player game, choose 6 x 4 - 1 = 23 cards). Shuffle "The Thing" card (previously set aside) with these cards and deal 4 to each player to form their starting hands. 5) Shuffle the rest of the cards in the deck with the "Infected!" and PANIC! cards set aside earlier to form a single draw deck and place it face down in the middle of the table. STAY AWAY! - CONTAGION CARDS - These cards cannot be played or revealed to the other players (unless required by a card effect). STAY AWAY! - ACTION CARDS - You can only play these cards during your turn, never as a response to another card. They must be discarded after use. STAY AWAY! - DEFENSE CARDS - These cards can only be played in response to an action taken by another player or a PANIC! Card effect, and are discarded after use. After playing a Defense Card, you must immediately draw a replacement from the deck. If there are PANIC! cards on top of the deck, you must discard them without looking at them, until you draw one STAY AWAY! card to add to your hand. STAY AWAY! 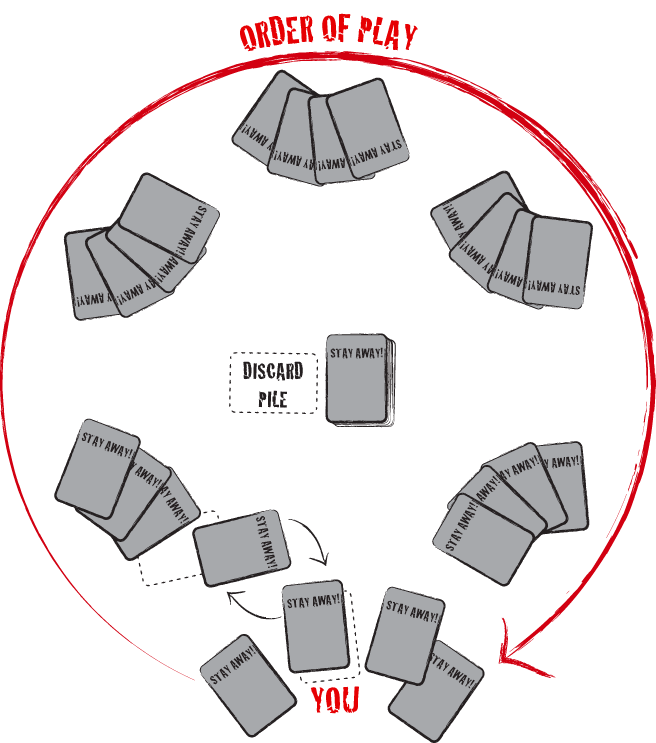 - OBSTACLE CARDS - These cards let you isolate yourself or another player. They remain in the game until removed by another card. PANIC! CARDS - The PANIC! cards are part of the deck. They are random events that can add suspense during the game. If you draw a PANIC! card during the draw phase of your turn, you must play it immediately, discarding it after you follow the instructions. PANIC! cards can never be part of your hand. You can only play a PANIC! card during the draw phase at the beginning of your turn. If you need to draw because of the effects of another cards (i.e., "Defense" cards, "Resolute", or some PANIC! 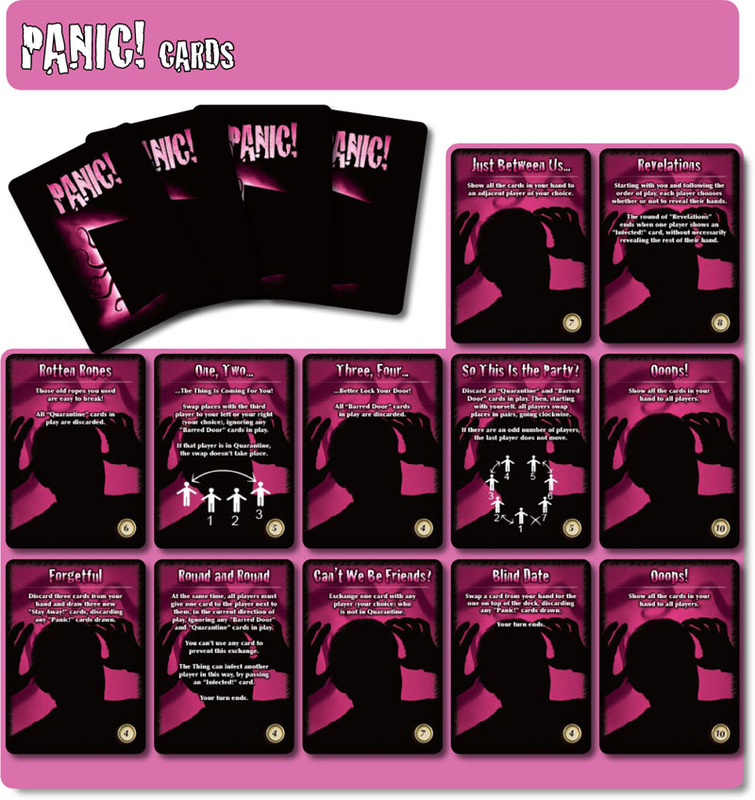 cards), all PANIC! cards on top of the deck must be discarded without looking at them, until it is possible to draw a STAY AWAY! card and add it to your hand. 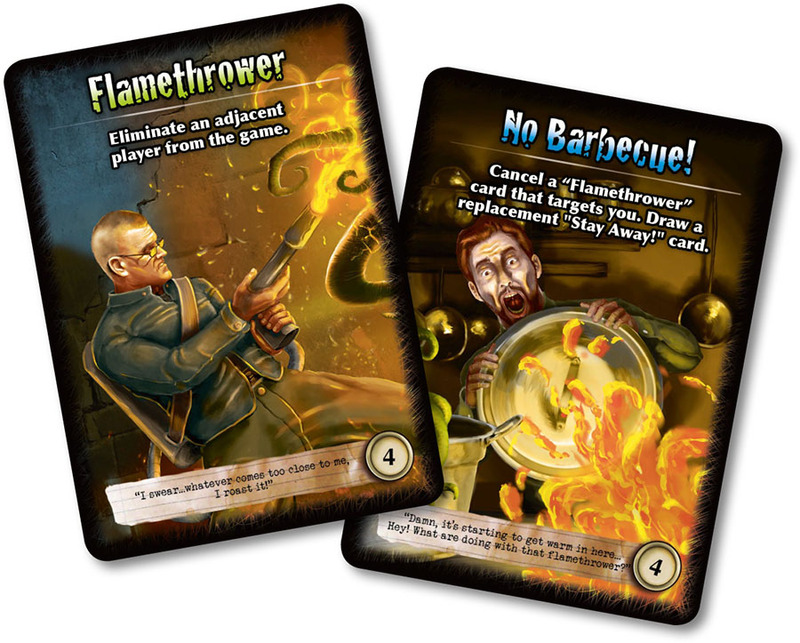 The "Flamethrower" is the only card that can be used to eliminate an adjacent player, regardless of their Role. If you suspect that a player next to you (right or left) is part of the opposing team, you can play this card to eliminate him. Unless that player has a "No Barbeque!" card in hand, he is eliminated from the game. He must put all of his cards on the discard pile without revealing them. A) The Thing is eliminated from the game. All Humans still in the game win as a team. The Thing, all Infected, and all eliminated players lose. B) No Human remains in the game. The Thing can declare that there are no Humans left. All eliminated players lose. Special Case 1: In the exceptional situation where The Thing is able to infect all the other players and no Humans have been eliminated from the game, The Thing is the only winner and everyone else loses! 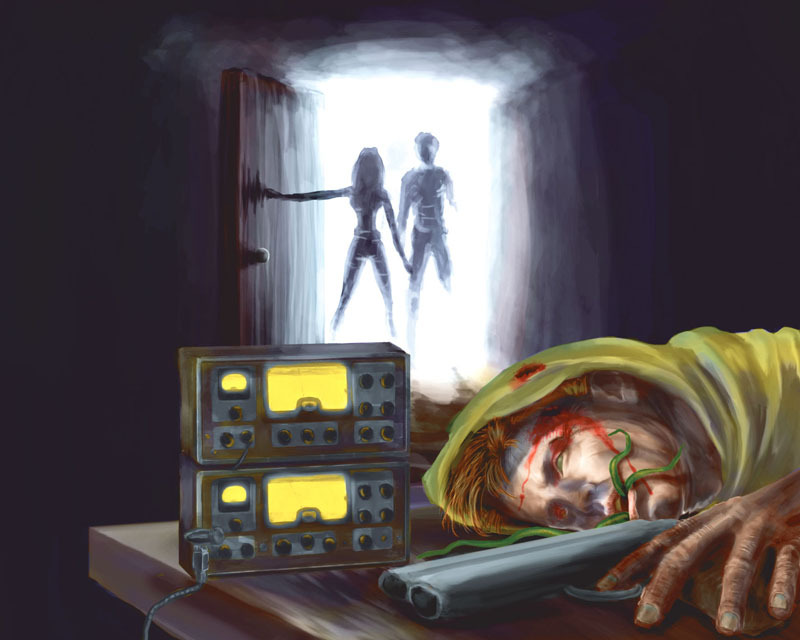 Special Case 2: If The Thing declares victory, but other Humans are still in play, the latter can reveal their identity and win the game, while The Thing, the Infected and all the eliminated players lose. 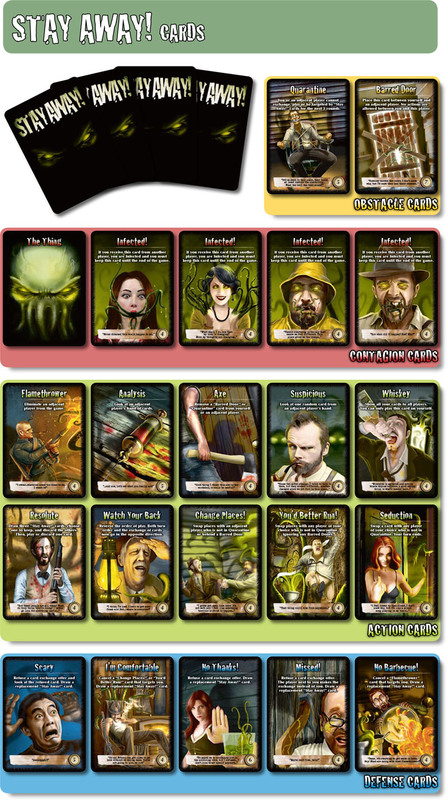 1) To increase the suspense among players, "The Thing" card can be inserted into the deck instead dealing it at the beginning of the game (especially recommended for 4 to 6 players). 2) To increase the difficulty of the game to the advantage of The Thing or Humans, it is possible to increase or decrease the number of "Infected" cards in the deck, at the discretion of the players. 3) To increase the difficulty of the game to the advantage of The Thing, the "Flamethrower" and "Analysis" cards can be added to the deck during Step 5 of setup, instead of dealing them out at the beginning of the game. 4) To increase the strategic component, a player can only use the "Seduction", "You’d Better Run! ", "Can’t We Be Friends? ", and "Get Out of Here!" 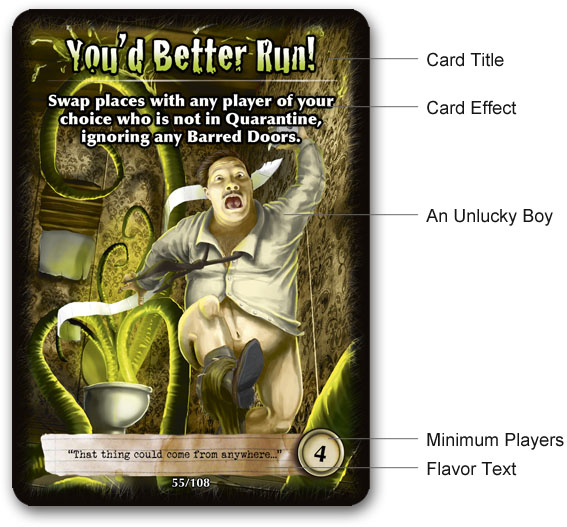 cards on a player to his right or to his left, unless there is a Quarantine or a Barred Door between the two players, in both directions. 5) More advanced players are free to build the deck to their liking by changing the cards used in the game. 6) VENGEANCE MODE: if The Thing is eliminated, and there are both Humans and Infected still in the game, the game does not end. Instead, the two factions have to fight it out until all of the Infected or all the Humans have been eliminated. The Thing (who alone can know all the roles) can still follow the game and give directions to the other players, at its discretion, without ever explicitly stating the roles of the other players. The Thing will declare the end of the game when all the Humans or all the Infected have been eliminated. All surviving players (Human or Infected) win, while all eliminated players lose. Hi sorry only speak English, got your Stay Away game, got cards 1-108 but the face of the cards have numbers 4-11, in the rules there is mention of cards with number 12, which I don’t have. Any ideas please? Hi Mark, both for 11 and for 12 players, you have to use all the cards (108). This is the reason why the cards are numbered until “11″, because they are valid from 11 players and up. I hope this will clarify you. Vorrei chiedervi un chiarimento in merito al regolamento del gioco Stay Away che ho acquistato qualche settimana fa. Premesso, vi faccio i complimenti perché il gioco è veramente geniale. Mi ha da subito conquistato! Comunque, quello che volevo chiedervi è: le carte “Spaventato” e “No, amico!” possono essere giocate solamente quando il giocatore PRECEDENTE a me chiede uno scambio carte e/o qualsiasi altro giocatore mi chiede una scambio carte (ad esempio con la carta “seduzione”)? Oppure possono essere giocate anche quando dovrei essere io a passare la carta al giocatore SUCCESSIVO a me (e quindi anche riceverne una da lui)? Leggendo il regolamento non sono riuscito a capirlo. In un primo momento ho pensato:”Che senso ha che rifiuti di scambiare la carta con un giocatore successivo a te?”. Poi ho pensato che in realtà potresti esseri ritrovato vicino ad un infetto e/o a La Cosa dopo un cambio di posto, quindi sarebbe molto utile rifiutare uno scambio (anche se saresti tu che dovresti passare la carta al giocatore successivo, seguendo così la direzione del giro). Morale della favola: quelle carte che ho riportato sopra, possono essere giocate solo in “difesa” o anche in “attacco” (cioè quando segui il giro)? Spero di essermi spiegato correttamente e di aver fatto una domanda pertinente. Ho provato a dare un’occhiata sul web e non ho trovato nessuna discussione a riguardo. le carte “Spaventato” e “No, Amico!” possono essere giocate soltanto in risposta ad uno scambio carte offerto da un altro giocatore, così come tutte le altre carte difensive (riconoscibili dal colore blu del titolo). Esempio: puoi giocare “No Amico!”, “Spaventato” o “Mancato!” per rifiutare lo scambio carta di fine turno offerto dal giocatore precedente, oppure allo stesso modo rifiutare lo scambio iniziato da una carta “Seduzione”, o ancora rifiutare uno scambio carta causato da un’altra carta carta “Mancato!” di cui sei bersaglio, ecc. In più, così come specificato nel testo di ogni carta difensiva, dopo aver giocato dovrai anche pescare una carta sostituitiva, in modo da ritrovarti sempre con 4 carte nella tua mano. Giocare carte difensive quindi, può avvantaggiare ulteriormente il giocatore in difesa, che oltre a difendersi avrà anche una possibilità in più di pescare. Yes thank you. All good now. Hi, sorry for the english! I was looking for the english version of the game. I cant find it anywhere. Are there any copies available? I’d love to have this game. Traveling Man in Leeds UK have a copy. You can find it on Amazon or many online stores for the European market. The good new is that to Ares Games, we will finally relase an English version for US market soon. Can I buy PnP version somehere? Hello Tomàs! No, there isn’t any PnP on sale. So is there any other chance to get this game in ENG version? I’d really really love to get one, looks promissing. Sure, Stay Away! Revised Edition comes to the US in 4th quarter 2016, thanks to Ares Games.